#30DayHomies Day 26, lots going on! It’s Day 26 and I have lots to share! I got 9 miles in this morning and I couldn’t be happier. It was a good run, it was about 45 degrees and it misted on us the entire time but I’ll take that over 28 degrees any day of the week! Ran an average 12 minute pace which is good for me right now. I’m taking things slow on my way back to hopefully avoid injuries. I finally ordered my Polar Heart rate strap to use with my watch. I was looking for more accurate calorie burn on workouts, especially like Nike workouts at home. I never imagined my calories were off as much as they were today. On a normal 9 mile run, Fitness Pal and the Nike app would usually tell me I burned about 800 calories, check out today’s burn with the heart rate strap! Yep, that says 1201 calories…the girls and I decided on today’s run that Saturday’s are our new favorite day to eat! I started out good, a nice healthy protein smoothie right after the run. My average heart rate was 162, there are points on the hills where it was 175-183 bpm. 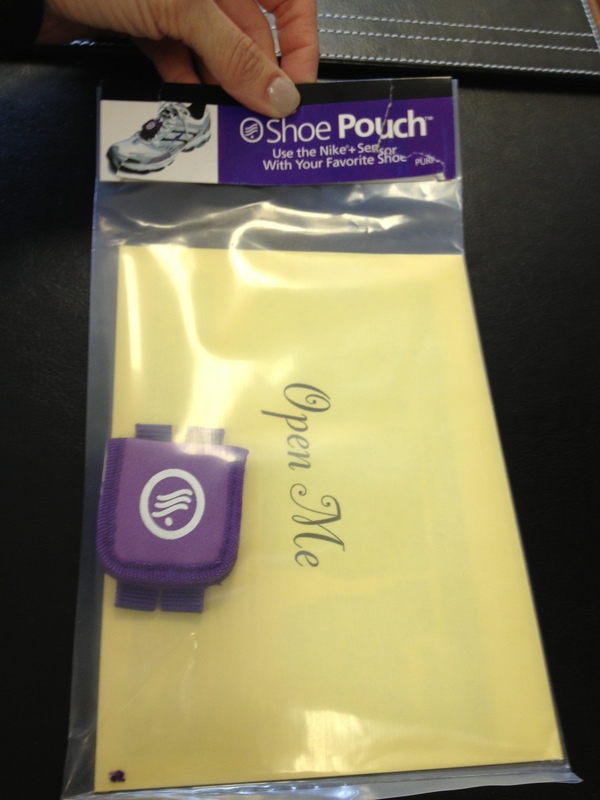 I have this lovely watch that has a shoe pod you wear for more accurate running. Unfortunately, the shoe pod only fits in Nike+ shoes. Someone mentioned on Facebook that there is a shoe pod holder that fits on your shoelaces. I promptly looked that up and sure enough I found this awesome little gem on Amazon. Of course I ordered it and it came today! I’m so excited! The shoe pod is supposed to give a more accurate reading of your run but it also works indoors, so when I have to run on the dreadmill it will work with my watch like I was running outside. They come in 8 colors but of course I got purple. You can get one here if you need it! The winner of the Nuun Hydration tablets is RRC Runner Mom, watch for an email from me! We still have the Muddy Buddy giveaway going on. The grand prizes will be announced in a few days, keep up the great work! What was your workout today? Anyone have a race today? 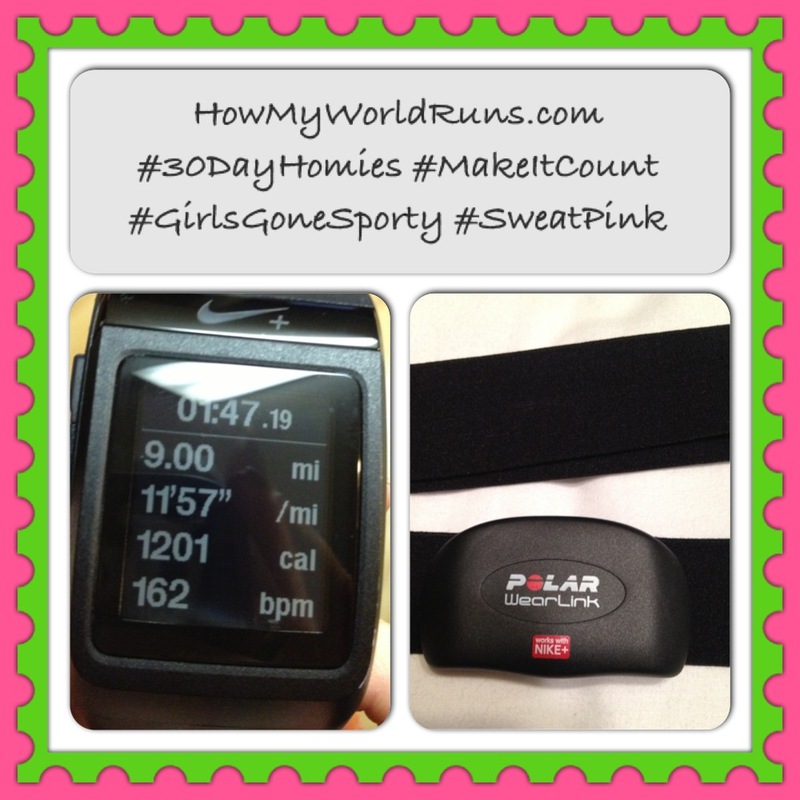 This entry was posted in Uncategorized and tagged #30dayhomies, how my world runs, nike, polar. Bookmark the permalink. 5 Responses to #30DayHomies Day 26, lots going on! I love the little pod holder. I’ve been using it with my NIke band as well & find it to be pretty accurate. Way to go on your run! I was aiming for 7mi today, but only got 6 in. There’s always tomorrow…. I have a garmin footpod that I leave snapped on my running shoes! I love it cause now I can track my TM & track running with the same watch as my outdoor running!! I went to the gym today, did some arm sculpting and did a Zumba class! It’s been so fun. I killed it today! Having a hard time raising my arms. 🙂 It motivated me to get the extra cleaning done around the house. Loving the energy I have now! Great run, Sarah. I did 37 min on stairmaster and walking lunges. I am a little bummed as I tweeked my knee on Friday. It’s not that it hurts, It’s more that its such an ominous sign… As I wasn’t doing anything too strenuous to promote such an injury.